What is gratitude and why is it important? According to the Oxford Dictionary, gratitude is the quality of being thankful, readiness to show appreciation for and to return kindness. But what is it really? The reason I wanted to write something about Gratitude today is because I feel 2016 was such a strange year. Well, for me, anyway. Of course, good things have happened to many people, including to me. I published my children’s novel, George And The Gargoyle Who Lived In The Garden in 2016 and I was supported by so many lovely readers who bought it. The novel was even bought by the central library in Enfield, which means that it is available for loan throughout London. I was able to buy my gorgeous new car, my Abarth, that I’d been wanting for ages. My wonderful students have achieved great things which made me very proud. I have been blessed to have amazing friends in my life and I feel that my relationships have deepened with those people who are very important in my life. For all of those things, and more, I am extremely grateful. I feel the world has entered a rather darker phase now than I have ever seen before. Strange political events, terrorist activities, the refugee crisis and war has contributed to make me feel this way. It is difficult to remain grateful in the face of such events. As someone who leans towards the metaphysical truths in life, I know that even these disturbing events have their place, but the human, three-dimensional part of me, can’t quite get my head around the state of the world at the moment. The fact that so many of our great icons, like Alan Rickman, Rick Parfitt, David Bowie, Prince, Zsa Zsa Gabor, Leonard Cohen, Robert Vaughn, Pete Burns, Terry Wogan, Gene Wilder, Caroline Aherne, Muhammad Ali, Victoria Wood, David Guest, Carrie Fisher and George Michael died last year, among so many other great people, makes me wonder if they all left because they know something we don’t. The craziness of life can be overwhelming and then, feeling gratitude may be the last thing on our minds, but I feel that gratitude is very important because it allows us to turn bad things and obstacles into opportunities. 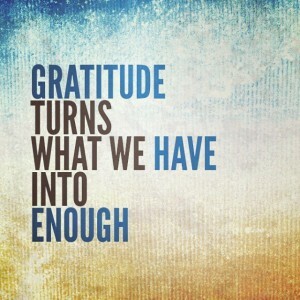 Gratitude also turns what we have into enough. Even though some scary things have to carry on from 2016, I trust that 2017 will bring clarity, joy and good fortune to us all. And lots of things to feel grateful for. Happy 2017! New year’s resolutions!